Will they keep my rental property in good condition? Are they likely to pay on-time? Will they cause trouble with the neighbors? What can I expect when communicating with this applicant? Finding a great tenant for your rental property requires due diligence and patience. Taking the time to ensure your renter is reliable and responsible may save you the hassle of eviction and costly repairs down the road. Before you select a new tenant, give their previous landlord a call. Below we’ll cover the top reasons why you should call previous landlords, the questions to ask during reference checks and how to use that information to help you make a better informed leasing decision. References from past landlords may indicate how an applicant would occupy your property, and this information could help you avoid a bad outcome such as late rent payments, property damage, complaints from neighbors, or an eviction. The eviction process is time-consuming and costly. According to a TransUnion survey, evicting a tenant may take up to three to four weeks, and costs an average of $3,500. Finding a long-term and responsible tenant is always going to be worth the effort, and landlord reference checks are an important part of the tenant screening process. Should I reach out to my applicant’s prior landlord and current landlord? It’s always a smart move to reach out to an applicant’s current landlord and at least one of their previous landlords. Doing so will give you a much better overview of your applicant and their behavior patterns. Why? The applicant’s current landlord may not be completely forthcoming if they are eager to get rid of a bad tenant. Be sure to cross-reference the opinions of the current landlord with the previous one(s) to get a fuller picture of your applicant. Calling a previous landlord for a second opinion can help you gain a more objective overview of your applicant’s past tenant history. Keep in mind that landlord reference checks aren’t foolproof; the landlord you speak to might not provide the most accurate information—whether that’s intentional or otherwise. If they manage a multi-unit property, they could confuse your applicant with someone else, and as mentioned, they might gloss over unsavory details if they’re eager to get rid of their tenant. For that reason, it’s important to conduct reference checks in addition to credit, criminal, income, and eviction checks for a more complete picture of your applicant. 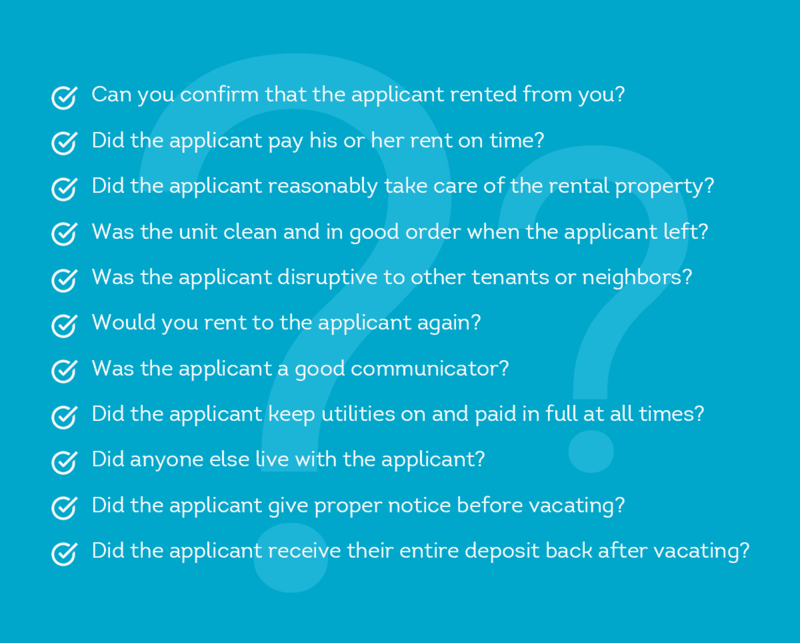 Come up with a list of questions before making the call to an applicant’s previous landlord. Here are some standard questions you might consider adding to your list. This list is wide-ranging, but by no means exhaustive. Use these as a starting point and add your own questions; come up with queries that will provide the information you need to make a great decision for your property. What should I do with the information provided by the applicant’s former/current landlord? 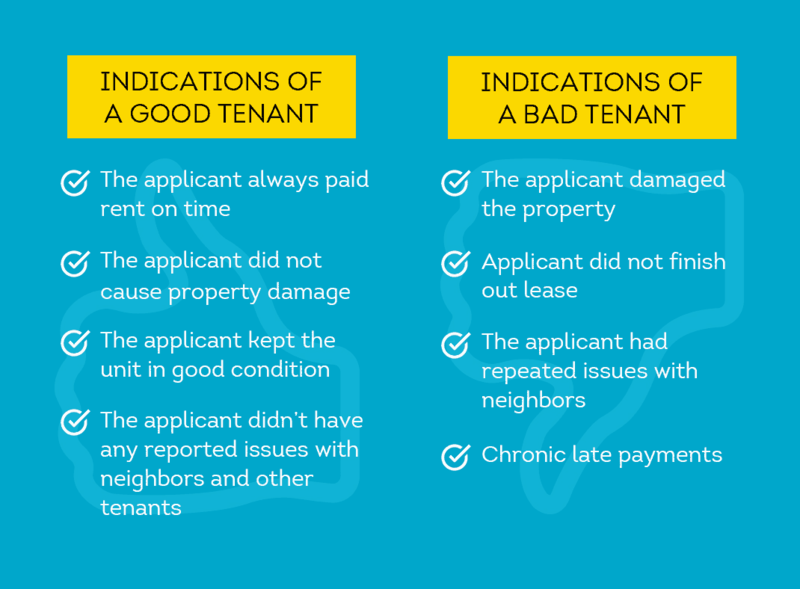 The responses gathered from previous landlords can be incredibly valuable, but be sure to comb through the information they provide to evaluate what could be biased or subjective—it’s up to you to decide whether or not the tenant is the right fit for your property. Using SmartMove in conjunction with your landlord reference checks can help you verify that your tenant is likely to be a good fit for your rental property. We offer nationwide eviction reports so you can obtain eviction records on your applicant. SmartMove also provides renter credit reports, criminal background checks and an income estimate to help verify your new tenant. With one of the largest FCRA-compliant eviction databases, which includes more than 28 million eviction records, SmartMove offers broad coverage and reliable data fast. When it comes to finding a good tenant, the more information you have, the better. Don’t get stuck with an unreliable renter; perform a comprehensive tenant screening that includes credit, criminal, income and eviction checks, as well as a phone call to the applicant’s previous landlords to help you make the best leasing decision for your property.